The flight is very short (30 minutes) and you arrive to the Lodge in the early morning. On the other hand, the bus and boat takes 4 hours and this service is escorted by a naturalist guide throughout the entire transfer. Its very important that at the time of the booking, you notify the name of the hotel where you'll be picked up at (in San Jose area) and also the name of the hotel where you want be returned to at the end of your tour. Very important. 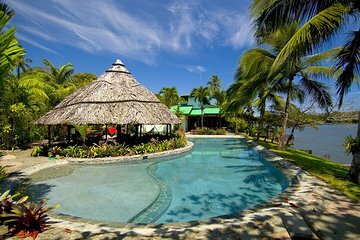 Included in this same package is the option to request the drop-off at the end of the tour in San Jose area, in Arenal Volcano area, Sarapiqui area and Puerto Viejo de Limon area (drop-off's at most hotels in this areas are included). Please inform the name of the hotel and learn if the drop-off is included or not within the same fee. Very important. Included in this same package and only for the way from San Jose to Tortuguero and vice versa, you can chose a flight from San Jose to Tortuguero (30 minutes) or to use the bus and boat combination (4 hours). The advantage to flight is that it only takes 30 minutes and you can enjoy the morning at the Lodge, on the other hand, the advantage to use the bus/boat combination is that this transfer is escorted by a naturalist guide so this transfer is a guided experience where you will learn about Costa Rica's ecology, culture and traditions. It's recommendation is to use 1 way by bus/boat and 1 way by plane. Remember this possibility only applies if the combination of 2 destinations is chosen: San Jose and Tortuguero . If you choose your drop-off at other location, the only option is by bus and boat. The pickup time on the day of the begin of the tour will be informed the day before the departure. This information will be sent by email to your account with Viator. You will also confirmation of the pickup time to the hotel where you request your pickup. Each traveler is allowed a maximum of 1 suitcase and 1 carry-on bag, 30 pounds in total per person.